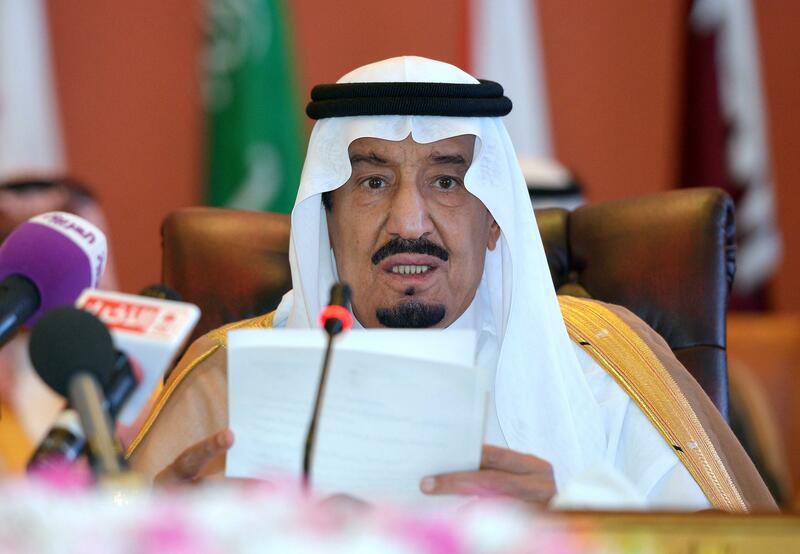 King Salman, then-crown prince, speaks during the opening session of the Gulf Cooperation Council on May 14, 2014. Salman Bin Abdulaziz al-Saud, who became the seventh king of Saudi Arabia on Thursday after the death of his brother Abdullah, is starting his new job on one hell of a week. The new king will immediately have to contend with yesterday’s collapse of the Yemeni government in what the Saudis view as an Iranian-backed coup right in their backyard. In addition to the Yemen situation, Salman has to deal with ISIS—Saudi Arabia is currently constructing a 600-mile-long wall along its northern border with Iraq to keep the group out—and manage his kingdom’s current risky strategy of keeping oil production high to intentionally push down global prices. Also: There’s renewed international criticism of Saudi Arabia’s human rights violations after a prominent liberal blogger was sentenced to 1,000 lashes. And the coming months could also bring a comprehensive international agreement over Iran’s nuclear program—an agreement Saudi Arabia is unlikely to back. The country has put out strong hints that it is considering a military nuclear program of its own. There’s little to indicate that Salman will handle any of these issues much differently than his older half brother. The two were close political allies and were both considered relative moderates. The 79-year-old Salman is believed to be the 25th of the 45 sons of King Abdulaziz, Saudi Arabia’s founder. So far, the Saudi crown has passed from brother to brother in rough age order rather than from parent to child like in other monarchies, meaning that the last few kings have all been very old men with relatively short reigns. Salman only got the job because the two crown princes ahead of him died before Abdullah. Thanks to the polygamy of Saudi royals—Abdulaziz had at least 22 wives—the country now has more than 7,000 princes. The new king is one of the “Sudairi Seven,” an influential group of brothers named for their mother, who hailed from a powerful clan, which also included former King Fahd. Salman was the governor of Riyadh from 1963 until 2011, a period during which it transformed from a backwater of 200,000 people into a major world city of more than 7 million. He then served as defense minister for three years, a job he has now turned over to his son Mohammad. He and his immediate family also own the media group that publishes the influential pan-Arab daily newspaper Asharq al-Awsat. He is very, very rich. Salman is a defense hawk. There are no signs he disagreed with Saudi Arabia’s occupation of Bahrain, for instance, and Saudi Arabia aggressively supported the rebels fighting Bashar al-Assad’s government during his tenure as defense minister. Domestically, he has a reputation as a modernizer from his tenure in Riyadh and is relatively moderate on social issues. (This is Saudi Arabia we’re talking about, so that means ensuring that women who try to drive are arrested by the regular police rather than the much harsher religious police.) He’s also famed for his punctuality, personal discipline, and role as the family enforcer, maintaining a private jail for misbehaving princes. Salman’s health is more of a question mark. Reports of his ailments range from a bad back to some form of dementia. There had recently been reports that the Abdullah-Salman relationship had soured and that the king was trying to undermine his heir’s claim to the throne. But the transition has gone pretty smoothly, and likely due to Salman’s age, his successor has already been chosen. The relatively sprightly 69-year-old Prince Muqrin, the youngest of Abdulaziz’s sons, moved into place as crown prince after Abdullah took the unprecedented step of naming him deputy heir last year. The most interesting development in the day since Abdullah died may actually be that Salman reached into the next generation, appointing his nephew, interior minister Mohammad Bin Nayaf, as the new deputy crown prince and second in line to the throne. This might have rankled some of his own sons, who include Sultan Bin Salman, a former astronaut, but so far no grudges have gone public. For now, despite the regional turmoil surrounding the Sauds, the family’s odd succession process seems to be humming along. But the long-anticipated day when a son of Abdulaziz no longer rules the kingdom will soon be here.